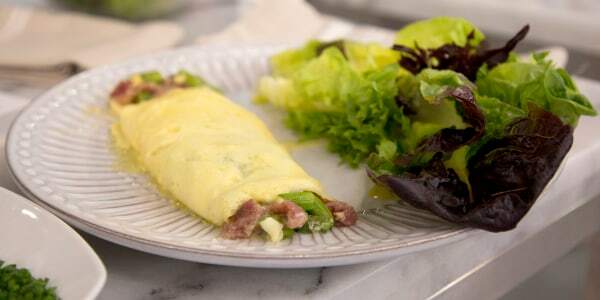 Enjoy an asparagus, prosciutto and Parmesan omelet at home with Freds at Barney's famous recipe and tips. Mark Strausman, author of "The Freds At Barneys New York Cookbook," is stopping by TODAY to share his go-to recipe and expert technique tips to make the perfect omelet. He shows us how to master the classic French method for making a tender three-egg omelet filled with asparagus, prosciutto and Parmesan cheese. "At Freds at Barney's we offer a different omelet every day, but this is one of the most popular," says Strausman. 1. A good-quality, heavy nonstick sauté pan is a must. A 10-inch sauté pan is the perfect size for the classic three-egg omelet. At Freds we don't use our egg pans for anything else so they stay pristine. 2. Get your ingredients prepped and ready before you cook. Prepare the omelet filling and have it waiting next to the stove so you can quickly add it to the eggs. 3. Vigorously whisk the eggs until they are very well mixed and creamy. We add a tablespoon of whole milk and salt and whisk it in, too. We do not, however, add black pepper; we let the customer add that at the table, if they like. 4. Use clarified butter for cooking since it doesn't contain milk solids that could burn and discolor the eggs. If you don't have clarified butter, use olive oil. 5. Use a heatproof rubber spatula to move the eggs in the pan, instead of a metal spatula, which could cut the eggs and prevent you from making a perfect tri-fold. 6. Cook the omelet over medium heat. This prevents it from browning, but also gives you time to control how the eggs are cooking. 7. If you like your omelet well done, you might want to place it, still in the pan, in a 350°F oven for 2 or 3 minutes after you've folded it.